If your company's measurement schematics are out of date or do not exist, you are now required to update/create these diagrams to satisfy 3173.11. Not sure how that might work, or where to get started? Take a look at our example site facility diagram. A time investment is in your future... why not make the most of that investment by developing those schematics in a tool that will add value to your measurement management processes? The muddyboots.online (MBO) Schematic tool is cloud based software that provides an equipment database approach to measurement flow diagrams, and is useable to satisfy Site Facility Diagram requirements. With the MBO build schematic builder, your Site Facility Diagrams can be auto generated based on templates you've reviewed and based on your companies equipment naming standards. A completed Site Facility Diagram program in MBO results not only in compliance, but a comprehensive equipment database including all wells, treatment, measurement and storage equipment. maintain your drawings over time with automation, not eyeballs and man-hours. Where MBO Measurement Schematics will save you even more time and money is in the long term maintenance of your Site Facility Diagrams. MBO sends automated notifications when diagrams have been changed, or need to be re-verified to maintain compliance. The intuitive MBO Schematic editor enables your field staff, not drafting companies, to make small or large changes to Site Facility Diagrams over the years. The MBO Versioning / Audit module will keep your historical drawings in a searchable database forever, saving investigation time during audits. Use equipment master data and automation to help compare your MBO equipment list with other master data lists from maintenance management or production accounting systems. Measurement is the cash register for any Oil & Gas producer. Can you afford to only have schematics for your BLM properties? Certainly, you can minimize the Site Facility Diagram set up to only Federal/Indian land to minimize the one time set up cost. Not having a current representation of all measurement points, fuel take offs, process equipment on all of your locations results in higher risk of Production Accounting errors. Building and maintaining measurement schematics, or measurement flow diagrams, for your entire operation allows you gain control and certainty that your companies' measurement is accurate, and your Cash Register is producing to it's full potential. Not convinced? Keep reading: Why bother with Muddy Boots Schematics? Muddy Boots Inc. offers cloud based schematic management software. Our Schematic software has been used by upstream producers and midstream companies for over 5 years. We are already working with producers to ensure they not only maintain BLM compliance, but to also enable them to accurately manage and share their measurement schematics with a searchable, fully audited measurement database. 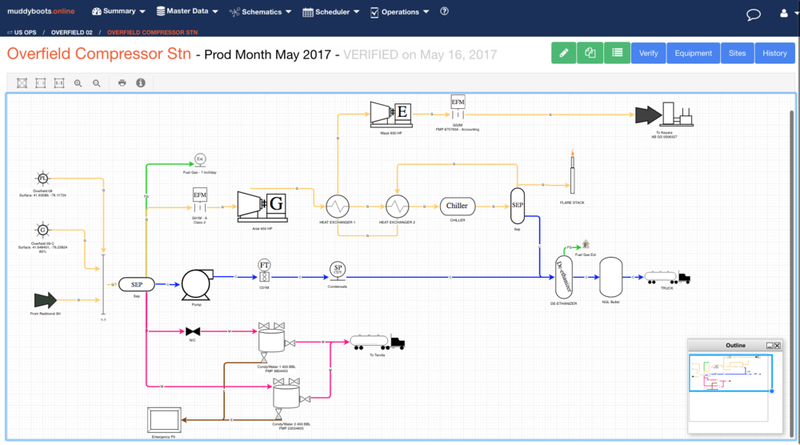 With no servers purchase or software to install, your measurement schematics implementation can be a process driven by the business, not IT. Please feel free to use the form or email addresses below to contact us for more information. We look forward to hearing from you!